Serendipity Reviews: Sunday Salon: The last itsy bitsy challenge! Sunday Salon: The last itsy bitsy challenge! This is the first full week back at school for the kids, due to all the snow over the last couple of weeks, so I have been trying to catch up on lots of jobs that needed doing. So my reading seems to have slowed down just a little this week and I have been choosing rather thin books to read. I had a lovely day scrapbooking yesterday and came a lot closer to finishing my Christmas journal. I only have four pages left to do now, which I hope to get done throughout the week. I finished reading How I Live Now by Meg Rosoff, which is a fantastic YA novel, as well as Thaw by Fiona Robyn, which was quite a depressing read, but very powerful too. I also read The Gourmet by Muriel Barbery, which is one of those books that makes you hungry the whole way through; not a good choice when you have recently started your New Year diet. At the moment, I am working my way through two books. Hush, Hush by Becca Fitzpatrick, which is about a fallen angel; it took me a little while to get into this, as I found the writing really didn't flow to begin with, but it is getting better. Persepolis by Marjane Satrapi which is a brilliant graphic novel, dealing with Satripi's childhood in Iran during troubled times. I got lots of new books from Amazon, as well as lots from the library, which I have been waiting on. I shall show you all those tomorrow. I wanted to let you know that I have joined one more challenge too. How could I resist a challenge that allows you to read books about books and reading. I love books so much, of course I want to read them too. Here are the details from Leslie's blog. The challenge will be to read a set number of books that focus on books or reading. These can be fictional works, such as The Eyre Affair or The Shadow of the Wind; or non-fiction works such as 84, Charing Cross Road or The Polysyllabic Spree. There are hundreds, if not thousands, of books out there that would fit this challenge. The challenge begins on January 1, 2010 and ends on December 31, 2010. You must sign up for the challenge by January 31st, 2010. Doesn't that sound fun. I am going to go with three books to start with, but may upgrade if I get through these quickly. I am not sure which books I will read yet either, as I like to go with the flow and see which ones take my fancy. If you want to join, you will find the link here. Talking of challenges, I wonder if someone might be able to help me. I am trying to join the Victorian 'Our Mutual Read' challenge and I have sent a few emails to Amanda who is running it, but I haven't been able to contact her. If anyone knows how I can actually get on the blog roll, please could you let me know or please let Amanda know that I am desperate to join. Thanks. So that is my reading week, what have you been up to. Playing catch up when the routine gets back to normal is a lot of work. My son's been gone for a week, and I don't think I'm caught up yet. Good luck with your new challenge! Fahrenheit 451 was good and its focused on books. youve got some great reading going, i've heard good things about persepolis. I'm bad but I'm actually not interested in Hush Hush at all. It seems too shallow if that makes sense. 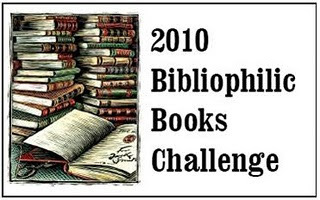 I was so happy to find the Bibliophile challenge last month. Doesn't it sound like fun??? Oh, those challenges just reach out and grab us, don't they? Sounds good, though. As does your week. I really liked Persepolis too. Good luck with the new challenge! Good luck with your challenge Viv. I've signed myself up for so many it's just crazy. Sounds like you still got a lot of reading done even though you were busy. Have a great week! You've had a great reading week! I hope this week is just as great. Happy reading and have a great week! Good luck with the challenge, Viv! We're a nation of wusses. Can't wait to hear what you think of Hush, Hush - it's on my wishlist. Good luck with your challenge, hunni! I do hope you're enjoying Hush, Hush more than I did! And I read Persepolis last Saturday! I find it hilarious that we read a lot of the same books without realising it.